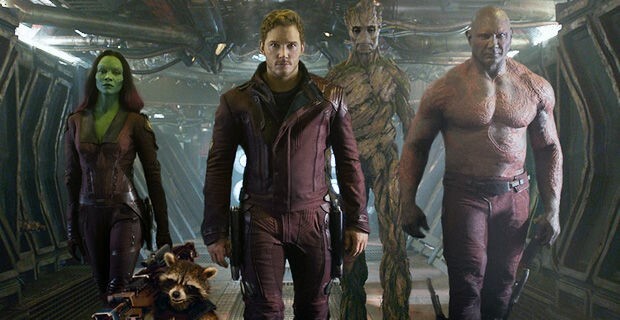 Marvel’s “Guardians of the Galaxy” Raises the Bar! Just when we thought the Marvel Cinematic Universe could not get any bigger or better, Guardians of the Galaxy, directed by James Gunn, raises the bar even higher! 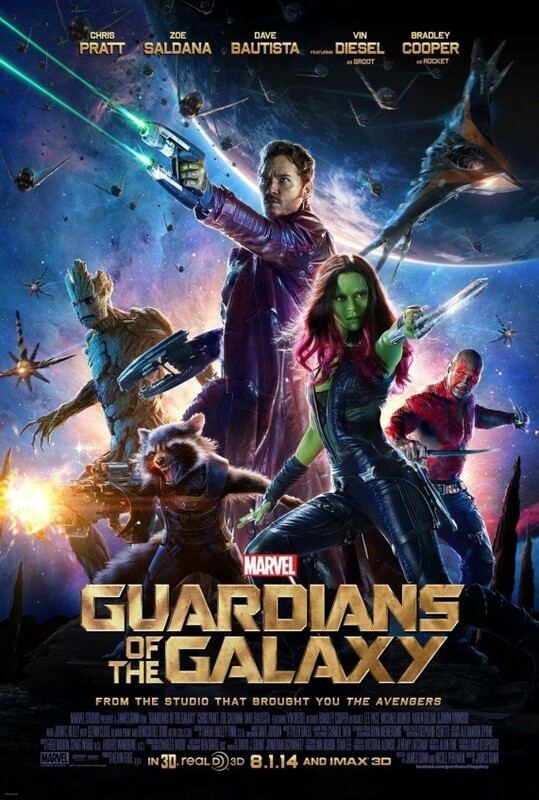 Based off of the Marvel Comic Book series, Guardians of the Galaxy follows five unlikely heroes. No, seriously, these five are literally the most unlikely group of people to come together for a common cause: to stop Ronan the Accuser (Lee Pace, The Hobbit: Desolation of Smaug), a servant of Thanos, from getting an artifact that could potentially impact the universe in a bad way. Now if you remember the post credits scene from The Avengers, Thanos is the purple guy who says something incredibly cryptic (see the picture below). 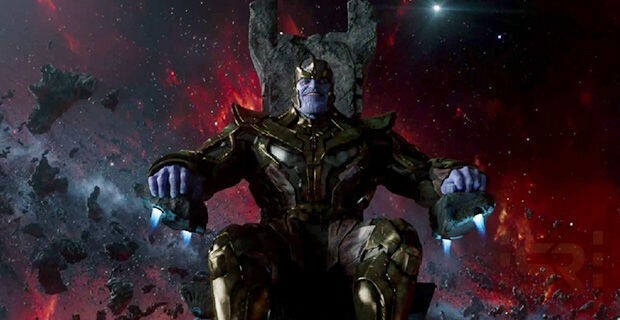 Anyway, Thanos is after something big, and that will play a part in the overall plan in which the Marvel Cinematic Universe has so cleverly devised. Enough about Thanos (for now), back to the Guardians. What makes them so unique is how they all come together as well as their previous questionable employment–they were all outlaws. Let’s do a roll call…. The leader of the group, Peter Quill, a.k.a. Star Lord (Chris Pratt, Parks and Rec. ), is from Earth. He was abducted by the Ravager and galactic outlaw, Yondu (Michael Rooker, The Walking Dead) in 1988 when he was about 8 years old. Quill is never seen without his trusty Walkman tape player. He is a bit cocky, but he has a big heart and can’t resist helping his friends. Then there is Gamora (Zoe Saldana, Star Trek). She is the daughter of Thanos (yeah, remember him?) and a trained assassin. She wants nothing to do with her father and in fact has it out to betray him. She is a quick, strong fighter, and whatever you do, do not double cross her. Speaking of quick, let us not forget about the quick-witted Rocket Raccoon (Bradley Cooper, The Hangover). Rocket is the result of animal experimentation with cybernetics. He is quite the tinkerer, as he is seen several times tinkering with various pieces of tech. He’s out to make a quick buck, so he’ll take any bounty he can get. He has also escaped a total of twenty-two galactic prisons. Also, do not call him vermin or rodent. It’s not pretty. “Exclusively in that order,” as Rocket is ever so quick to explain. And finally, Drax the Destroyer (Dave Bautista, WWE) is out for revenge. Ronan the Accuser killed Drax’s wife and children; he swore Ronan would die by his hand. Together, they form The Guardians of the Galaxy, and they are out to protect an orb that contains one out of six infinity stones. Other infinity stones include the Aether and the Tesseract, both of which were previously seen in Thor, Thor: The Dark World and The Avengers. Marvel does a fantastic job with keeping true to the style of the comics, as the film retains a very nice balance between humor and action which is also found in the pages of the comic books. Like most Marvel films, the CGI is high-tech and realistic. Gunn was the perfect choice to direct and co-write Guardians, and the casting was absolutely perfect. Each actor gave outstanding performances. Overall, I highly recommend seeing this film–especially if you are a Marvel or sci-fi fan (I’ve seen it twice!). Guardians of the Galaxy also stars Karen Gillan as Nebula, Glenn Close as Nova Prime, John C. Reilly as Corpsmen Dey and Benicio del Torro as The Collector.